Schneider Electric announced the latest addition to its industrial software portfolio, EcoStruxure Augmented Operator Advisor augmented-reality (AR) software. The new solution brings together physical, real-life objects with virtual objects to increase operational efficiency, reduce costs and improve proactive maintenance. EcoStruxure Augmented Operator Advisor combines contextual and local dynamic information for mobile users in the field through an intuitive tablet interface that superimposes real-time data and virtual objects onto cabinets or machines, giving operators immediate access to relevant machine and process information. Reduced downtime. Operators can virtually open electrical cabinet doors to troubleshoot issues with machine components. There is no need to shut down operations. Faster operation and maintenance. Operators can quickly find information, with immediate access in the field to real-time data, user manuals, instructions, diagrams and more. Less human error. The software locates the right equipment and guides operators step-by-step through complete maintenance procedures. EcoStruxure Augmented Operator Advisor’s interface gives operators access to information in the field for operations and maintenance, including machine history, variables of processes and documents and more. It allows for diagnosis of issues without lockout or electrical qualification and provides opportunity for safe and rapid detection of abnormalities and access to key performance indicators, according to its maker. EcoStruxure Augmented Operator Advisor can be utilized in a variety of industries, including mining, minerals and metals, water and wastewater, food and beverage, and infrastructure, but can ultimately be adapted for any industrial domain. It can be customized by Schneider Electric’s experts who collaborate with customers to identify individual requirements and develop custom augmented-reality applications for their specific applications and needs. The plug-and-play architecture works on tablets (currently iOS, with Android and Windows versions in progress) and utilizes a Windows-based PC as the server platform. The server receives the data to share with the tablet from multiple sources, such as programmable logic controllers (PLCs), Structured Query Language (SQL) databases and OPC Unified Architecture (UA) servers. The software is compatible with servers and components from any vendor to ensure flexible integration into any existing system. We're thinking about your digital transformation in 2018...are you? 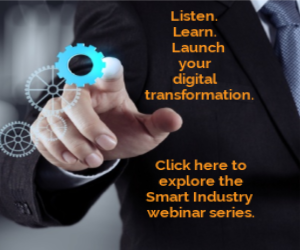 Click here to learn about Smart Industry 2018.